Artemis is the ancient Greek Goddess associated with wild nature, witchcraft and women’s mysteries. She was known to the Romans as Diana. Artemis was born on the Island of Delos, the illegitimate daughter of Zeus and Leto. Right after She was born, Artemis helped Leto give birth to Her twin brother Apollo. Apollo’s delivery was difficult, and so Artemis became known as a Goddess of childbirth. Artemis as Goddess of the Moon and femininity is the perfect complement to Apollo who is the God of the Sun and masculinity. Zeus granted Artemis her greatest wish; that She never would be forced to marry. Artemis is a Goddess of independence and autonomy Who is ruled by no one but Herself. Artemis also received a bow and arrow, a pack of hounds and nymphs to accompany Her. The Great God Pan Himself gave Her the hounds. 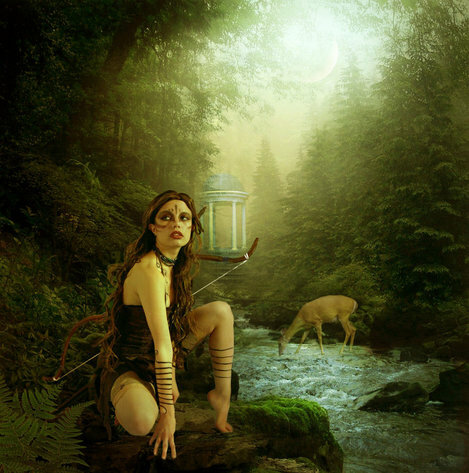 Artemis as Mistress of the Hunt protects the wilderness and sacred hunting rituals. She spends Her time roaming the forest, meadows and waters edges. She can bestow or remove fertility from plants, animals and humans according to Her will. Artemis is also able to take the lives of animals and people and is the Gatekeeper who decides who lives and dies. In Her Moon Goddess aspect she carries torches or has stars circling Her head. She wanders the wilderness by the light of the Moon or by torchlight. The Moon is Her spinning wheel upon which She spins the fate of human beings. Artemis is associated with the Moon trinity of Selene who rules in Heaven, Artemis who rules on Earth, and Hecate who rules the Underworld. Artemis can be a stern and unforgiving Goddess, especially towards men. She can be merciless to any who offend Her. She favors women, but will also punish them if they fail to do Her bidding, but She will also act quickly to protect and rescue those who call for Her help. Artemis was invoked by women in labor and She is the protector of youth, especially of young girls. Artemis wears a short tunic, carrying a silver bow and arrows, and a shield bearing the image of a wolf. She has a chariot which is drawn by stags. OFFERINGS – Offerings on behalf of wild nature and animals, honey cakes. Place offerings on the Altar or at crossroads at midnight or noon.